Filipovits, E., Babb, S., Caron, J., Light, J., McNaughton, D. (2018, March). 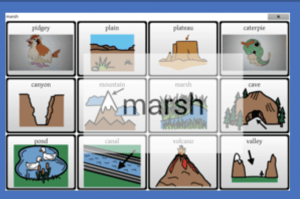 Grid-based AAC apps to support academic sight word learning. Poster Presentation at the 2018 Pennsylvania Speech-Language-Hearing Association (PSHA) Convention in Pittsburgh, PA.
Changes in federal policy have promoted a new emphasis on teaching academic content to all students. This includes those who require AAC to communicate and participate. These students must have access, be involved, and progress in the general curriculum, and therefore, instruction must be adapted to meet their needs.